With a rainy night in Manchester, Getintothis’ Jessica Borden finds The Boss undeterred by the weather in a marathon three hour set. The heavens open as we approach the Etihad Stadium, but it won’t dampen anyone’s spirits. 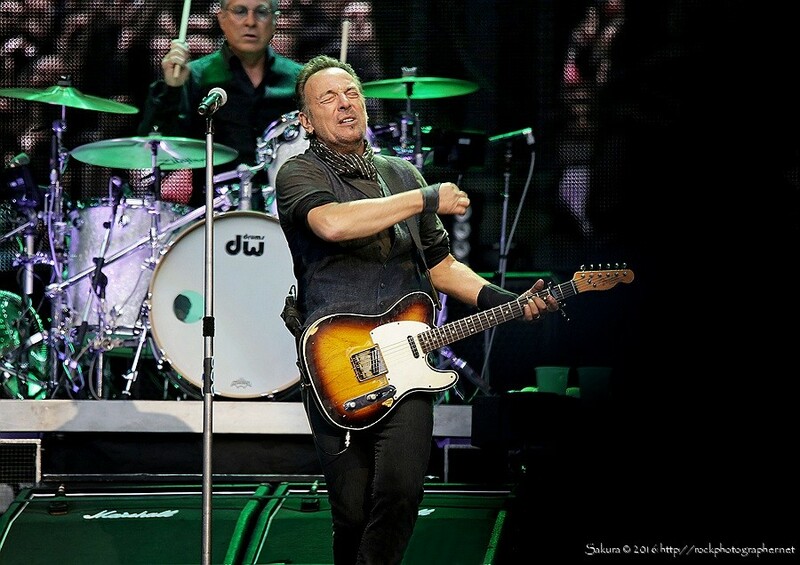 Bruce Springsteen & The E Street Band are known for the power of their marathon sets. 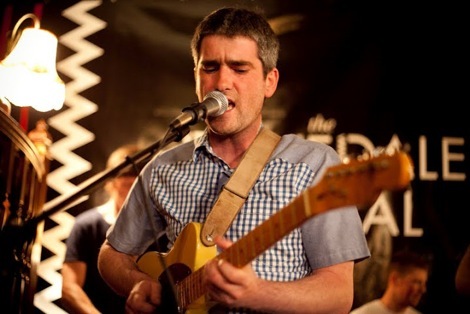 Both the band and the audience have unrivaled commitment to the pure love and passion of music. 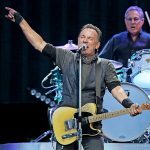 With no support, the E Street Band walk on stage followed by Springsteen a little before 7pm (before most gigs even open the doors!) and the roars from the crowd echo throughout the whole stadium. 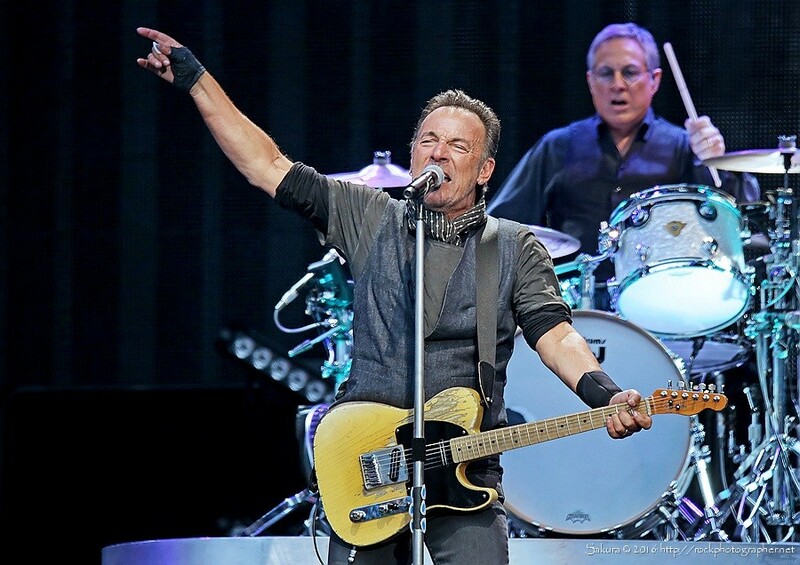 “It’s raining in Manchester – again!” Bruce jokes. “I wouldn’t have it any other way!”. 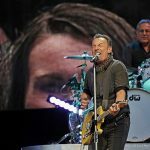 He launches into an unexpected duo of openers; an electrified Atlantic City from Nebraska and Murder Incorporated – a new track from 1995’s Greatest Hits set. It gave the proceedings a tone of recession. 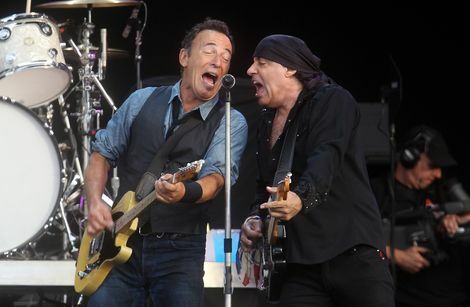 Springsteen is nothing if not a social commentator and the beginnig of the set reflects that perfectly. The weather only seems to add to the atmospheric nature of these songs as it continues to pour throughout the night. Badlands is the first real air punching moment, complete with full audience interaction. As this tour comes off the back of a reissue of 1980’s The River, songs from the album naturally form the centrepiece of the show. 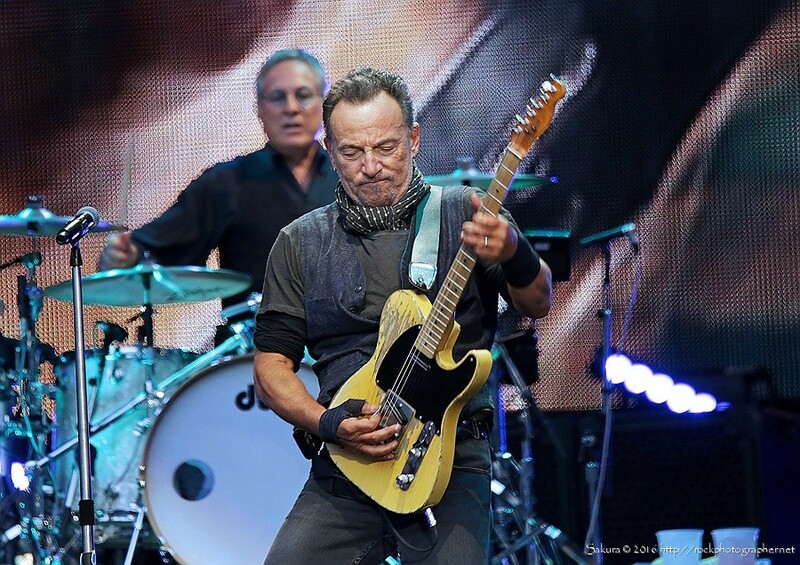 The Ties That Bind leads into Sherry Darling, when Springsteen makes his first of many forays into the crowd. The good old frat rocker could be a lost party anthem as the whole crowd belt out; “Hey, hey, hey! What you say Sherry Darling?”. 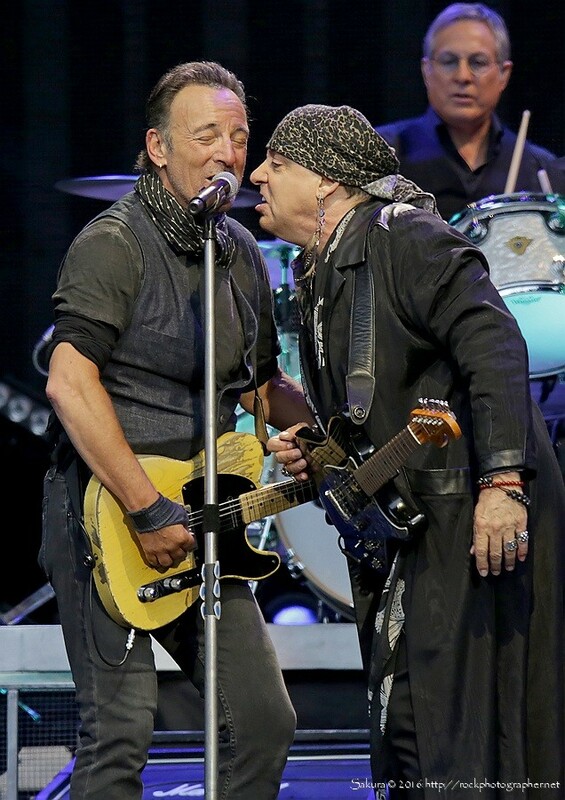 This is continued with Two Hearts (and it’s coda of Marvin Gaye and Kim Weston‘s It Takes Two), complete with much mucking around from Springsteen and “Little” Steven Van Zandt. 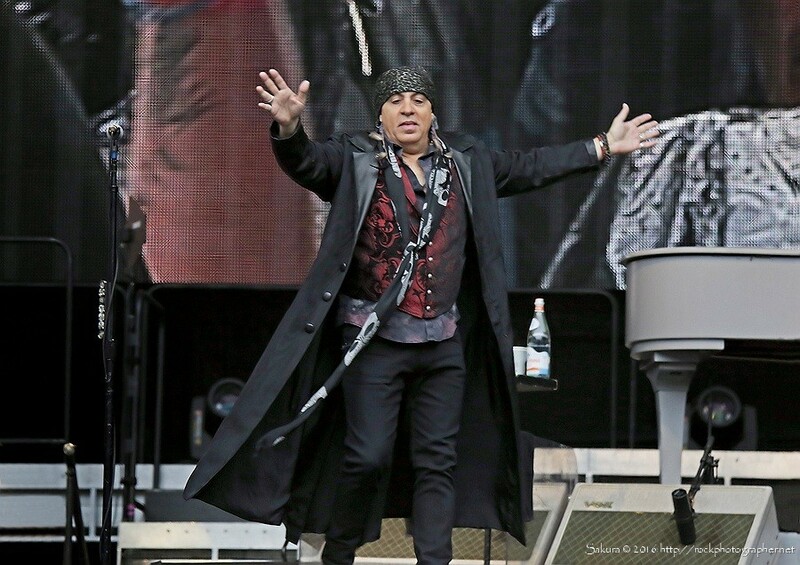 His old friend and star of The Sopranos has taken his natural position as on-stage foil following the death of saxophonist Clarence Clemons, and their hi-jinx lead to several laugh out loud moments. Incidentally, Clemons’ place on the saxophone is taken by his nephew Jake. After the previous Wrecking Ball tour replaced Clarence with a full horn section, Jake holds his ground enormously well for his first tour as the sole sax player. 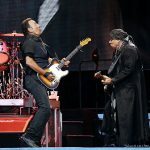 Clarence wasn’t just a great player, he was an enormous on stage presence, and Jake is proving his worth, adding some youthful vigour to the band full of guys and gals in their 60s. More songs from The River follow, with Springsteen‘s first pop hit Hungry Heart (originally written, bizarrely, for the Ramones) and live favourite Out In The Street. 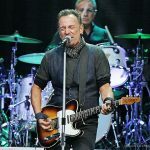 The River itself leaves the entire audience in awe, the heartbreak of the song is seemingly felt as passionately by Springsteen as his fans. 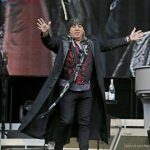 Each of his songs still appear close to him and effect him in the manner of when they were originally written and performed just as much as it is held dear to every fan. Waiting On A Sunny Day seemed pretty apt as the rain continued to fall. 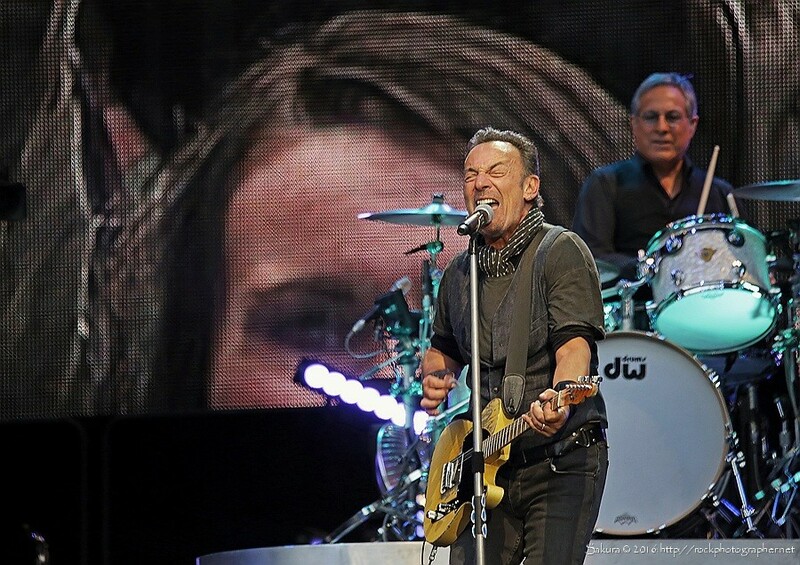 Bruce spots a young girl in the crowd with a sign reading “This is my first concert“. He pulls her up on stage for a chorus in an incredibly sweet moment. She seizes up a little and starts giggling uncontrollably. The crowd encourages her and Bruce gives her a hug. 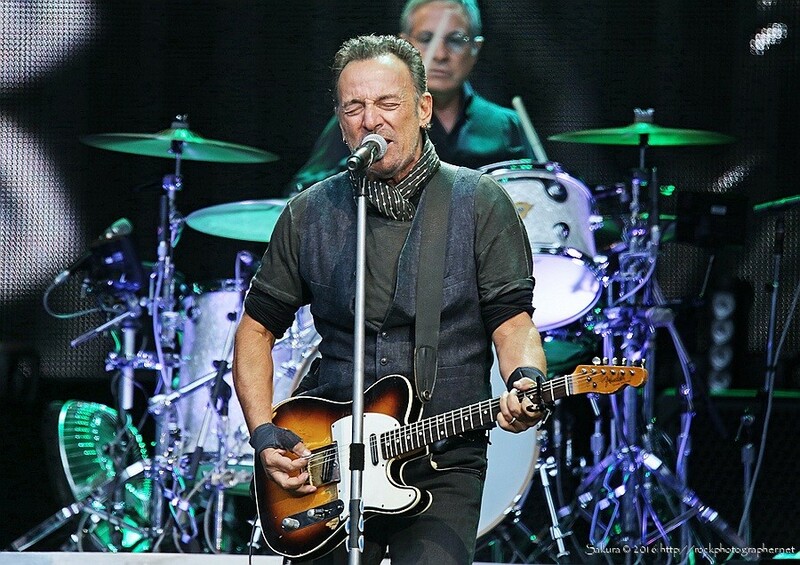 Because the Night, written by The Boss for Patti Smith in the late 1970’s, is welcomed like an old friend by both the band and crowd. 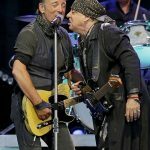 It has become something of a showpiece for Nils Lofgren, and his guitar solo sends the crowd in a frenzy as he ends on several fast 360 degree spins that defy his double hip replacement. The main set ends on a double whammy of The Rising and Thunder Road. 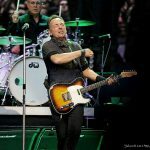 Born To Run‘s opener is a song which will forever hold an insurmountable power with it’s lyric; part “Lets get out of here” and part “We’re stuck here“, the melancholy of not taking the chance. “It’s a town full of losers and we’re pulling out of here to win“. 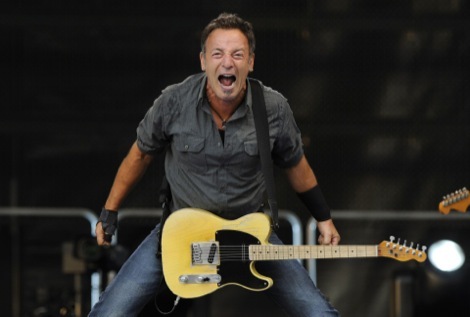 An emotion we are sure everyone has experienced on some level of intensity in their life and it is shown just how well Springsteen has managed to score the music to so many people’s lives. 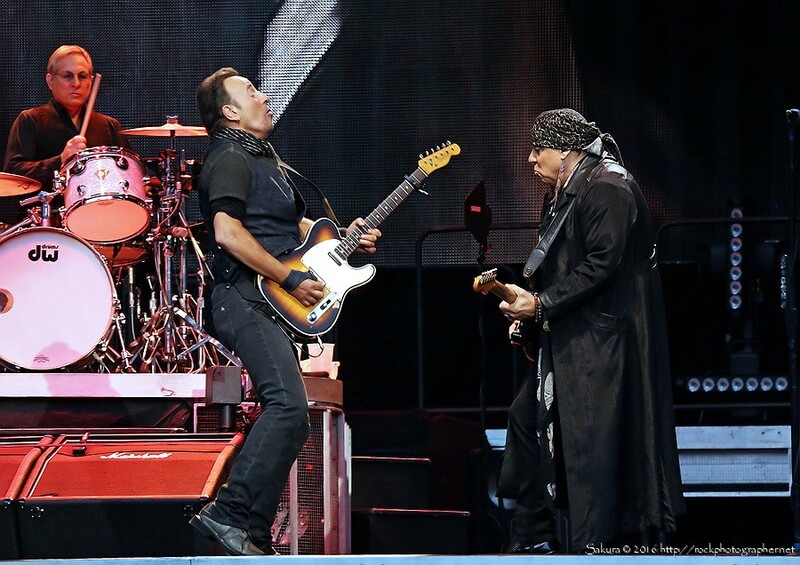 The encore begins with another request from a member of the crowd, and the beautiful piano intro (courtesy of the Roy Bittan, one of the greatest piano players in rock & roll history) to Backstreets sees Springsteen once again casting his spell over the entire stadium. But it’s a bit dour to end the night on, so out come the big guns; Born To Run, Glory Days (with even more mucking around from Bruce and Steve) and Dancing in The Dark are played in a storm of fan favourites, with the floodlights lighting up the entire place and the crowd singing back every word and dancing with the passion of the E Street Band. Tenth Avenue Freeze-Out begins and just before the final verse Springsteen announces “This is the important part” and the line “…the big man joined the band” is sang by the entire stadium whilst a video of footage of the sadly departed saxophonist Clarence “Big Man” Clemons and keyboardist “Phantom” Danny Federici is shown as a tribute to the bandmates they have lost. This appears the best and only way to truly celebrate their lives. 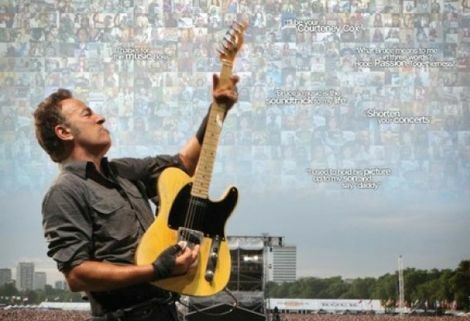 As Springsteen takes his final bow to an adoring sea of people, it is understandable just why they are such a legendary force to be reckoned with. Losing so many icons recently makes you appreciate the ones who are still here even more. 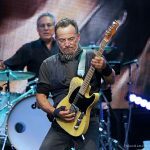 The E Street Band are still doing everything they always did with a passion that still lights a fire in the souls of people – judging by the eclectic make-up of the crowd – of all ages. At just over three hours, this was one of the shortest shows of the tour so far (possibly due to the weather), but the idea that anyone went away grumbling is absurd. They call him The Boss for a reason. He gives you reason to believe.